The son of the famous racing driver Antonio Ascari who was killed at Montlhéry when Alberto was just seven years old. 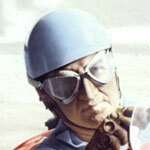 In 1949 he joined the Ferrari team - Enzo Ferrari had been a close friend of his father. More than a million people lined the streets in Milan for his funeral. So distraught was his friend Gianni Lancia that he decided he had had enough and handed his team, including spares, drivers and monocoques, to Ferrari after Ascaris death.